"When alchemist Sydney is ordered into hiding to protect the life of Moroi princess Jill Dragomir, the last place she expects to be sent is a human private school in Palm Springs, California. But at their new school, the drama is only just beginning." I was originally expecting quite a different cover for the UK release, but at sometime the designers must have decided to use the same as the US release. I actually think this was a pretty good decision. Everyone knows I am not a fan of faces on covers, but I kind of expect to see them on Richelle's books now and it works. I particularly love the tattoo design on who would be Sydney's face. Strangely though I'm not tempted to get this tattoo, like I wanted a Molnija mark. I've been a big fan of the Vampire Academy books for a long time now. Obviously I was happy to see that series get a resolution, but also bummed that it was over. Imagine my excitement when I heard of a spin off series!!! I loved that it was decided to develop Sydney's character more. She was pretty awesome and seemed like she had more layers. This book really does show that. I was also excited to read more of the vampire Academy world, but from a different perspective. It really was fascinating to read. I really enjoyed how Sydney's character changed even further. You could see how she starts off very controlled and regimented, even after her adventures in the VA books she was still trying to be what people wanted her to be. This does take somewhat of a turn and its so empowering. Rebellion is so fun to read!! I was quite surprised by the inclusion of a bullying storyline. Bullying is a huge hate of mine, having been through it myself. It actually broke my heart a little to read that it even happens in a 'vampire' world. I guess I did become quite involved with the story!!! It was fantastic that there were whole new stories and characters, yet old characters popped up here and there. Kind of like seeing old friends unexpectedly whilst shopping. The book concluded with one whole story being resolved, yet leaving room for more questions and stories to evolve. I can't wait to see what comes next!! 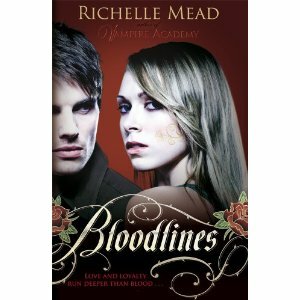 This is a rare good review of Bloodlines. All my friends seems to have disliked it. I'm nervous to try it out myself. Well as you can see by my rating, I didn't find the book perfect but it was definitely enjoyable.